Happy New Year's Eve! No, not that one - - the eve of the new liturgical year. Several years ago it was suggested to us by a friend that we should celebrate this new year as well. 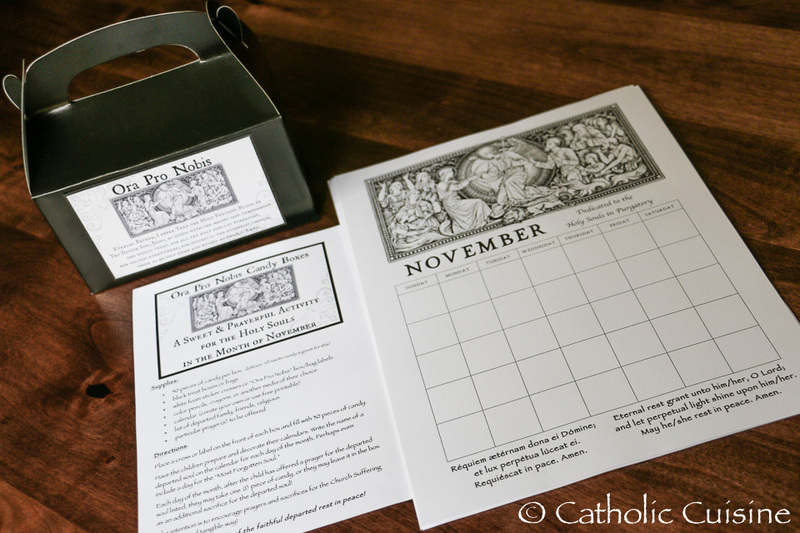 As we begin a new liturgical year on Sunday, the first day of Advent, it is a fun time to recognize the changing of the liturgical year in your homes. Sometimes we have had a party and celebrated with friends, but generally we are more low key but always trying to ring in the new year with something festive like sparkling cider to toast the new year. You don't have to stay up late. Anytime during the day is fine as the new year ushers in with the anticipatory Mass times on Saturday night. 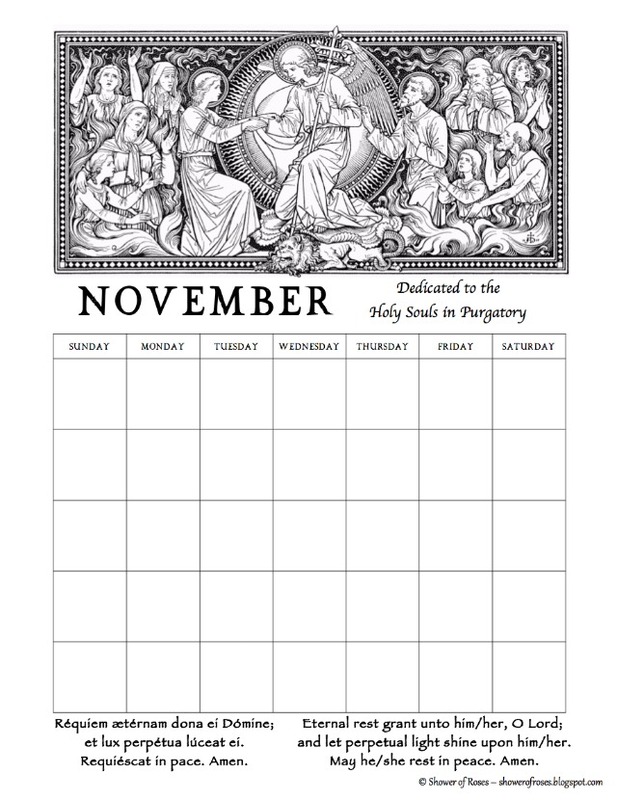 And you can even celebrate on the first day of the liturgical year (Sunday) instead of the eve. We usually do our toasting the old year and ringing in the new at dinner one of those days. So here is to a new liturgical year. For St. Catherine of Alexandria's feast today we made a pizza wheel. 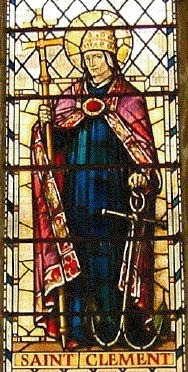 St. Catherine was an early Christian martyr. She was set to be tortured on a spiked wheel but at her touch it miraculously broke apart. She was then martyred by beheading. The wheel is one of the symbols associated with her. This is a variation of a traditional pizza with the center cut and "wheel spokes" folded over to form a wheel shape dough. It could be made with a sweet filling as well and served as dessert or breakfast. In this recipe, we went with a traditional pizza. The red of the sauce recalls her martyrdom as well. This recipe will make a large size pizza or two smaller crusts . We made a luncheon size today with half the recipe. Combine yeast, salt, honey and water in bowl. Add the flour and oil and mix with dough hook. Add flour until dough comes together in a solid ball. Grease a bowl with oil, add the dough, cover and let rise in warm area until doubled (about 1 hour). Spread dough on parchment paper. Cut center into eight sections like picture - leaving approximatley 3 inches around outside uncut. Spread sauce, cheese and toppings as desired around uncut part of ring. Fold over each "spoke" and attach to outer edge by pinching dough together. Transfer to baking sheet or stone. Cook at 400 degrees for 12-18 minutes. 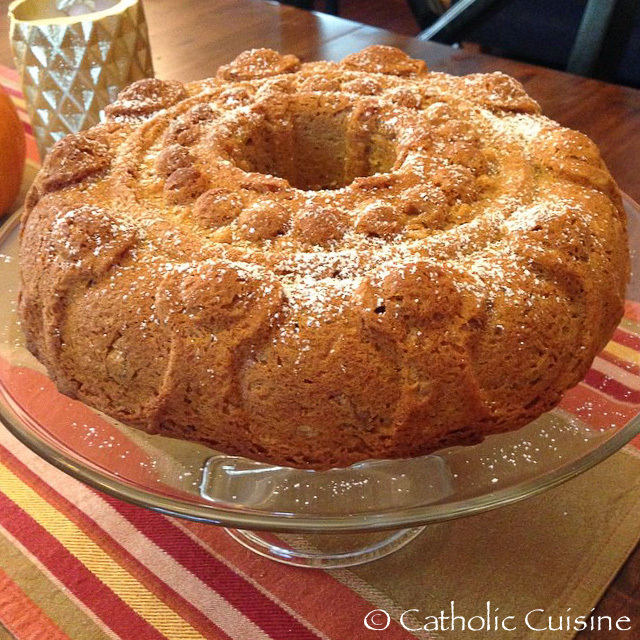 Our family is celebrating with a Persimmon Cake baked in a Crown Cake Pan. You can find additional Crown Cakes and recipes for the feast of Christ the King in the archives as well as even more suggestions over at Catholic Culture! 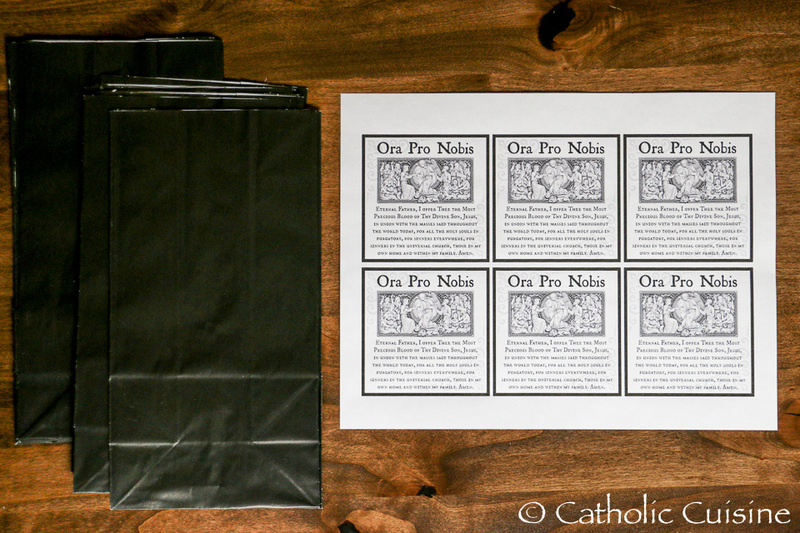 I always appreciate the fast and easy ways to remember a saint on his or her feast day. We especially enjoy sparkling drinks for special occasions and IZZEs are one of our favorites. So there was no way we could let St. Clement's day go by without thinking of "clementine" IZZE as a drink for the day. No prep and very festive. We did add some anchor straws to tie in his symbol. And of course what could be easier than a Clementine cutie for a snack as well. 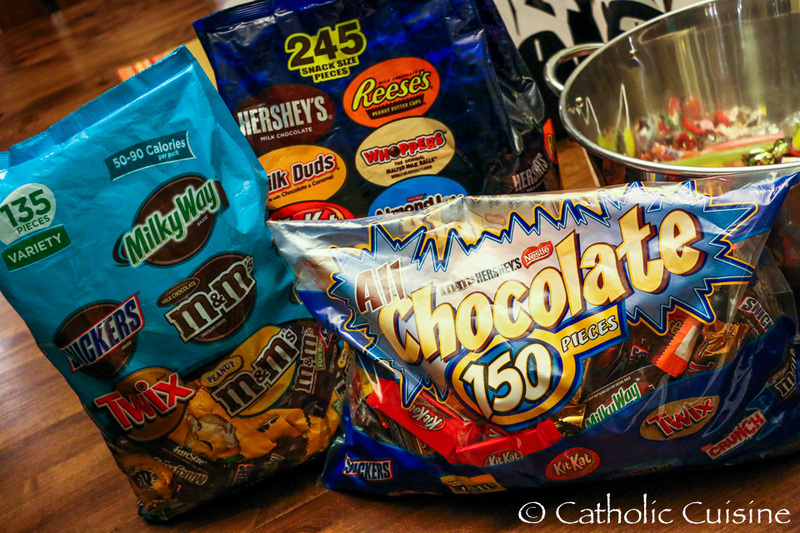 Happy snacking on the feast of St. Clement, martyr and Pope. Pope St. Clement, disciple of St. Peter and St. Paul, is mentioned in Philippians 4:3, "I ask you also, true yokefellow, help these women, for they have labored side by side with me in the gospel together with Clement and the rest of my fellow workers, whose names are in the book of life." He was consecrated a bishop by St. Peter and is listed as the 3rd or 4th pope (depending on listing). He is considered to be the first Apostolic Father of the Church. According to the Catholic Encyclopedia, Clementines in the name given to the curious religious romance which has come down to us in two forms composed by Pope St. Clement I. The Greek form is preserved only in two Manuscripts and consists of twenty books of homilies. Pope St. Clement was exiled to the Crimea and was martyred in the persecutions of Trajan around 100 AD, being thrown from a ship with an anchor around his neck. He is depicted in papal robes and his primary symbol is the anchor. Among his many patronages are sailors and blacksmiths. St. Clement's Day was a big celebration in many places, with metal workers and blacksmiths getting the day off. There are many traditions associated with it, including "clementing" or "clemening" - a custom of children going door to door asking for apples or other treats in exchange for singing. When I learned in my reading about his writings being referred to as Clementine literature, the tasty little citrus fruits immediately came to mind as a great connection to this papal saint. It is perfect timing as the clementine cuties are just starting to become abundant in the stores - this is the beginning of their peak season - right as we celebrate St. Clement's feast! 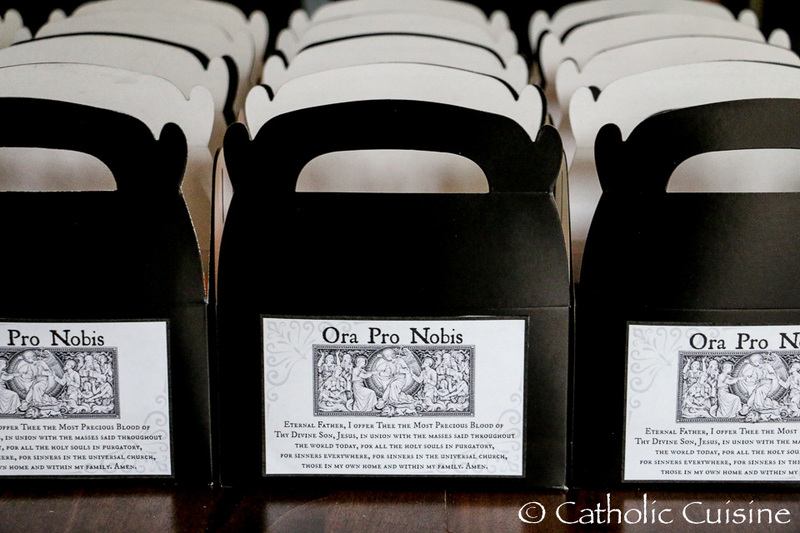 Here is a snack idea to make to celebrate his November 23 feast day. The recipe comes from The Food Network blog (contributor Dana Angelo White). It is a tasty, unique blend of sweet and salty, and I have always loved the combination of citrus and chocolate. In addition to the clementine name similarity, the use of the sea salt recalls his connection to the sea, place of his martyrdom and receding sea miracle associated with that. They are so pretty, too. It is a simple snack to prepare so great for a busy day when you want to celebrate the feast but don't have a lot of time. And so easy to make that it is a good cooking with kids project. Peel clementines and separate into sections. Melt chocolate in microwave (or in double boiler). Dip each wedge in chocolate. Set on wax or parchment paper. Sprinkle chocolate with pinch of sea salt flakes while chocolate still soft. Let set to cool and solidify chocolate. Serve when set. Can be placed in the refrigerator to speed the setting of chocolate. 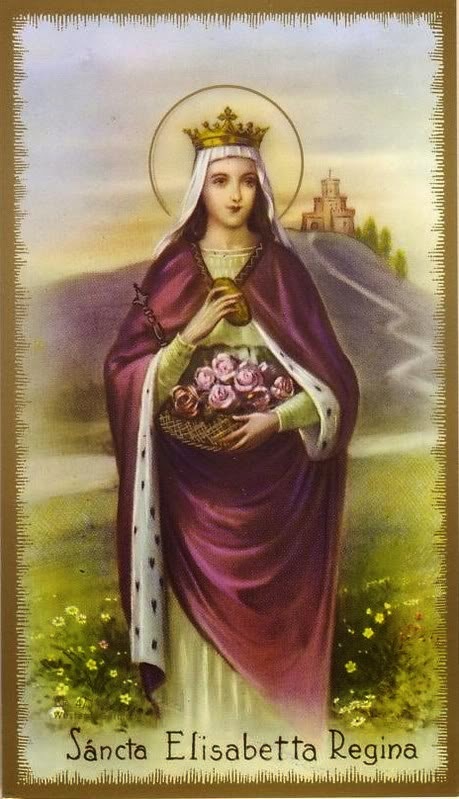 Today, November 17, we celebrate the feast day of St. Elizabeth of Hungary. As a queen she felt that she should care for all her people as if they were her children. She was known for her generosity to the poor. Legend says that on one occasion in the middle of winter she left her castle with her apron filled with bread for the poor. On the way she met her husband. He opened her cape to see what she carried and found her apron full of roses, not bread. When he bent to kiss Elizabeth he found her face transfigured with the radiance of heaven. Both roses and bread are her symbols, so as we celebrate her today and recall her charity to the poor, what better way than with a rose shaped bread. Braided bread is associated with many Eastern European countries such as Hungary and while this particular style is referred to as Russian Rose Bread, it seems particularly fitting for St. Elizabeth since it is bread shaped in a rose. It can be filled with either a sweet or savory filling. This morning we made a cinnamon rose bread for breakfast. It can be made using a generic bread recipe. In this case I made a sweet bread dough. The recipe and ingredients for this one are similar to those shared a few years ago by Charlotte - Hungarian Cinnamon Bread. The main difference is the shaping technique used to end up with a rose shaped bread here. Roll dough into large rectangle. Spread butter over dough, sprinkle with brown sugar and cinnamon. Roll up dough tightly along lengthier side. Pinch edge of dough to seal well. Cut the roll in half lengthwise. Starting at the top, cross over the strands in an X, repeat crossover to twist the two lengths together into long braid. Wind braided strand into a circle keeping cinnamon slits facing upward. Fan open as needed to create rose/flower petal look. Place on bottom of greased springform pan. Add springform pan sides. Let rise until double (30-40 minutes). Bake in 375 degree oven 20-25 minutes. 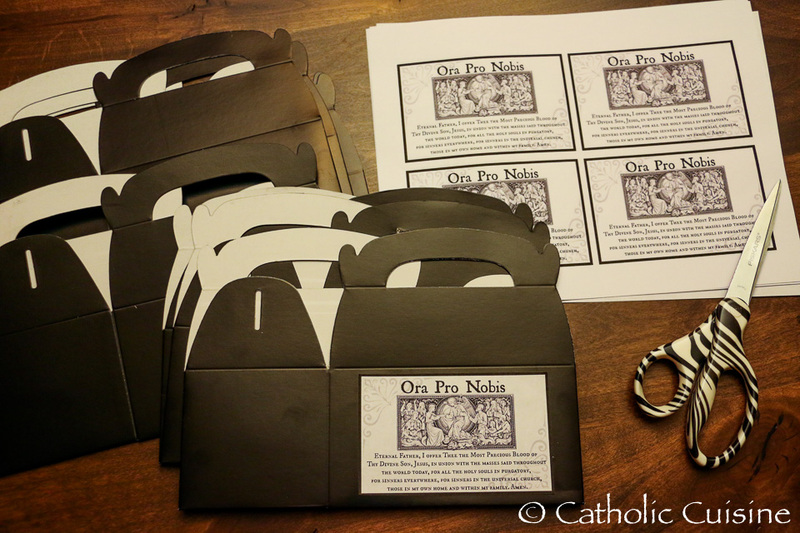 Additional idea: Make two, one to keep and one to share, in the spirit of Christian charity of St. Elizabeth. We will be having a potluck after Mass this afternoon and I'm bringing cake! 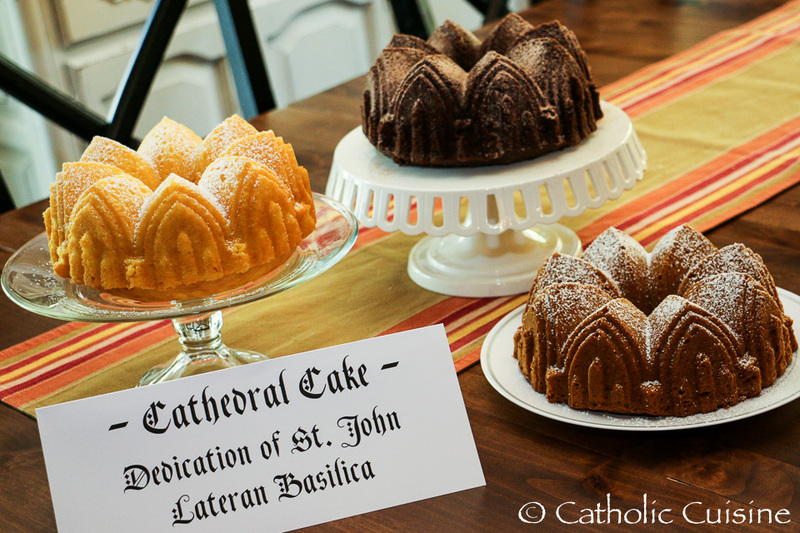 When I realized that the potluck was going to fall on this great feast I knew I had to bake at least one cake in my Cathedral Cake Bundt Pan. It looks like Jenn and I were thinking along the same lines! (You can read her great article for today's feast over at Catholic Culture.) I kept it simple and just baked Yellow and Triple Chocolate Fudge cakes with a couple Betty Crocker mixes, along with a Gluten Free Pumpkin Spice Cake. 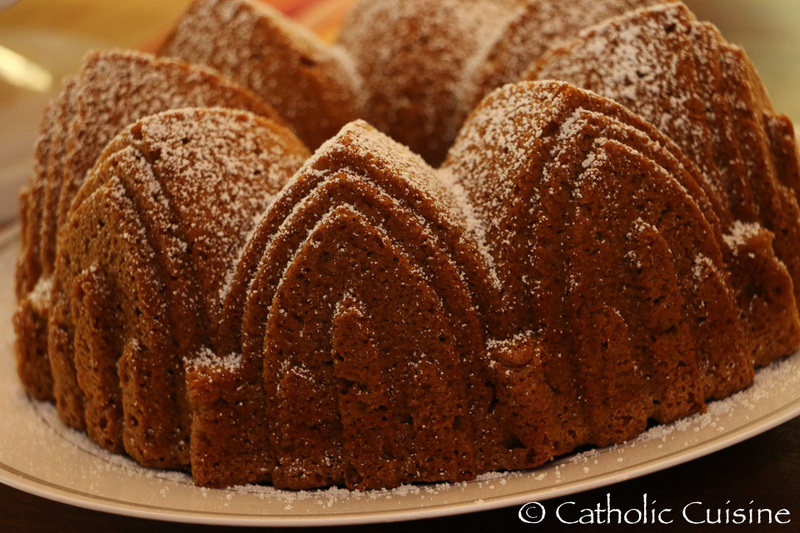 The Cathedral Cake Bundt Pan is so much fun and can easily be adapted for many different occasions. 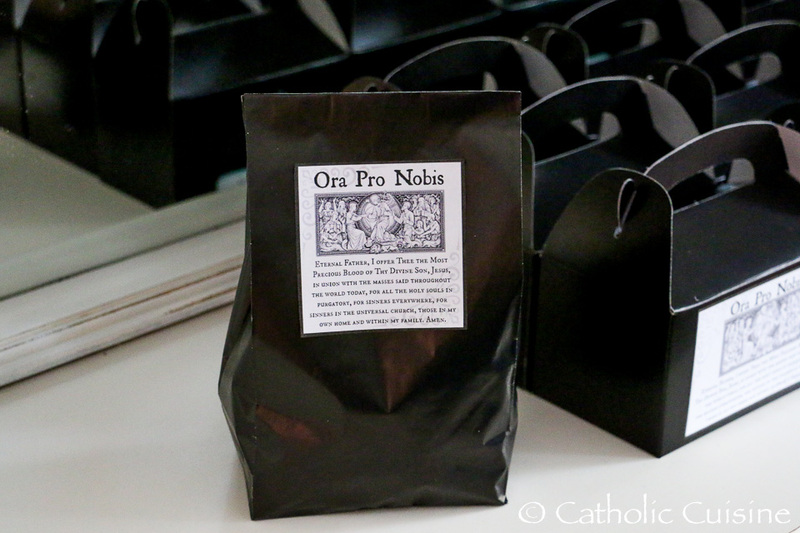 I've used it for birthdays, various feast days including the feasts of St. Joseph and St. Thomas Becket, and it also makes a beautiful cake for Christmas! O God, Who year by year dost renew the day of the consecration of this Thy holy temple, and dost ever bring us again in safety to the holy mysteries, hear the prayers of Thy people, and grant that whosoever entereth this temple to seek blessings may rejoice to obtain all that he seeketh. 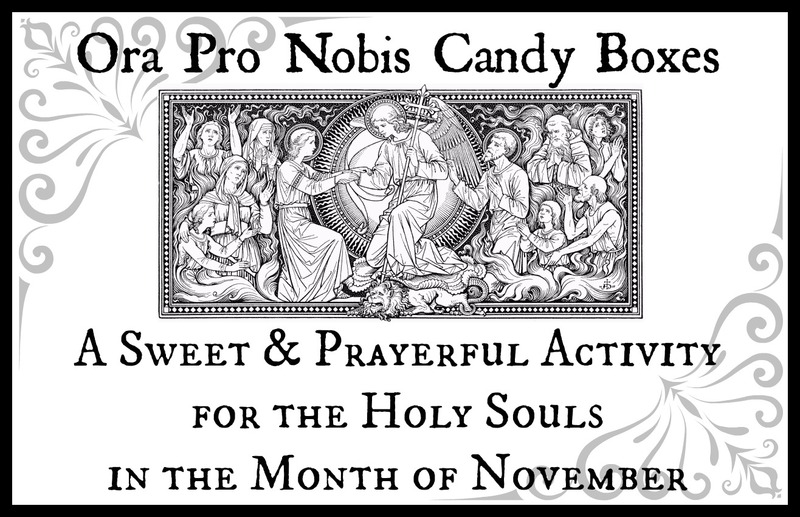 Ora Pro Nobis Candy Boxes make a sweet and prayerful activity for the Holy Souls in the month of November, the month dedicated to the Church Suffering. This idea was shared by one of my blog visitors (Thank you, Kim!) 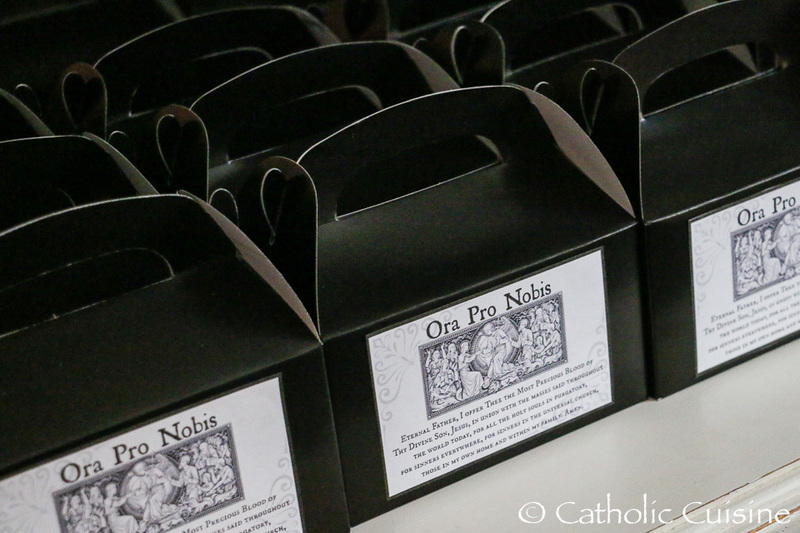 and I created the printable box or bag labels, calendar, and directions to share. If you have any trouble downloading the printable documents just send me an email and I will do my best to forward them to you directly. 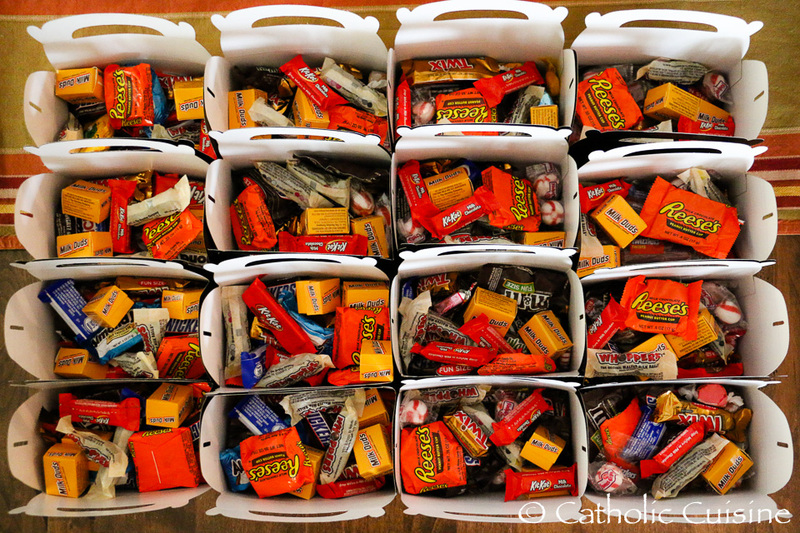 I ended up creating boxes to send home with all the children who attended our annual All Hallows' Eve party last night and my own children are so excited to begin today!